The big news for the Lions is that our boy Rocky is a MID only. Damn! Have a look at the list and highlight some potential AFL Fantasy options. The Lions have plenty of fantasy relevance for 2014. Jackson Paine ($180,200) could be a forward option as that’s where we might need to look for value. Claye Beams ($187,400) looks set to play round one and comes in very cheap. 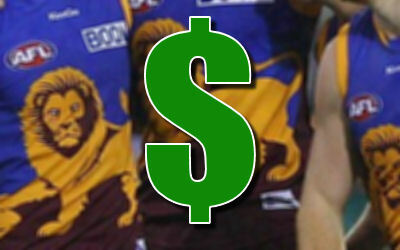 Our boy Tom Rockliff ($558,800) is the most expensive Lion but he loses his MID/FWD status and is just a MID. Still, he offers some value. Rocky, Hanley, Leuey, Aish, Taylor, Beams and Cutler are all firmly on the watchlist! Priced at $203,600, mid/fwd dpp, averaged 76 in 2012. If he plays round 1 he could be a good R3. Barring a pre-season injury, Beams is almost a lock for me at that price! Hanley is close to a lock again. Hopefully he gets rid of those dirty taggers for good.